Twelve years ago, my life changed forever. At 6:23 a.m. on January 20, 2003, my son Landon arrived in the world weighing 8 pounds, 6 ounces. Holding this healthy, beautiful little baby in my arms should’ve been the happiest moment of my life. But it wasn’t. Because, as fate would have it, January 20 is my birthday too. And sitting there in the maternity ward, it dawned on me that my special day would never be the same again. When I think back to the first few birthdays Landon and I shared, all I remember is anger. Why were there three candles on the cake and not 38? Why was everybody making a big fuss about his birthday but hardly acknowledging mine? By merit of me being several decades older than him, I undeniably had a much greater claim to the day. At most, he was entitled to a small sublet in the grand scope of the celebration. What did I do to deserve this, I’d wonder. It wasn’t supposed to be this way. Yet by the time Landon turned 5, I realized that, no matter how maddening and unfair it seemed, sharing a birthday was a reality I’d never be able to change. I couldn’t let it keep me from forming a stronger bond with my son. I’d just have to put on a brave face and do everything I could to make it work. There was no other choice. When I think back to the first few birthdays Landon and I shared, all I remember is anger. Unfortunately, there are no instruction manuals on how to navigate these situations. There are no correct answers, no solutions. 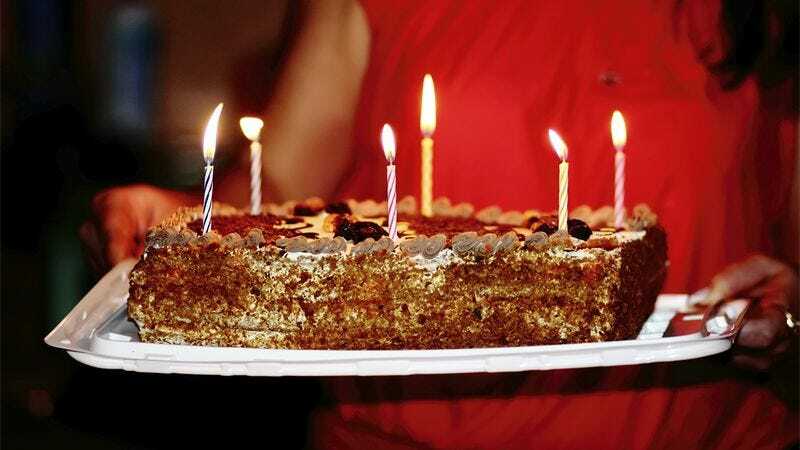 You’ve just got to forge ahead, making the most of the hand you’ve been dealt, conceding that sometimes you’re going to have to postpone your big birthday bash to the next weekend in order to hold things together. It’s not always pretty, but that’s what love looks like. And even though your child might not be able to fully appreciate the sacrifices you make for him, you make them nonetheless. Ever since embracing this attitude, the birthdays have grown a little bit better with each new year. But it’s never easy. There have been times when I’ve wanted nothing more than to spend my birthday dinner at Texas Roadhouse, where they let you throw peanuts on the floor, but I’ve instead put my happiness on the back burner because it’s Landon’s year to choose the restaurant. There have been times when I’ve spent my entire birthday morning setting up decorations for his birthday party, even though I could be setting up for a much more fun birthday party for myself. I do these things for my son because, as a father, it’s no longer all about me. I do these things in hopes that, years from now, when I’m getting old and he’s starting high school, he might return the favor. Nothing can change the fact that January 20 is, first and foremost, my birthday. But on the same note, nothing can ever diminish the deep love I have for my child. Yes, Landon actively sabotages my birthday each and every year, drastically reducing my quality of life. But, if I’m being honest, he’s actually one of the best birthday presents I’ve ever received (probably the second or third—my wife got me a pool table once). So, you might say it’s a wash. But I’m finally beginning to realize that—perhaps—having to share a birthday is still better than having no birthday at all.